You are Downloading LLB 1st Year Exam Routine 2017. 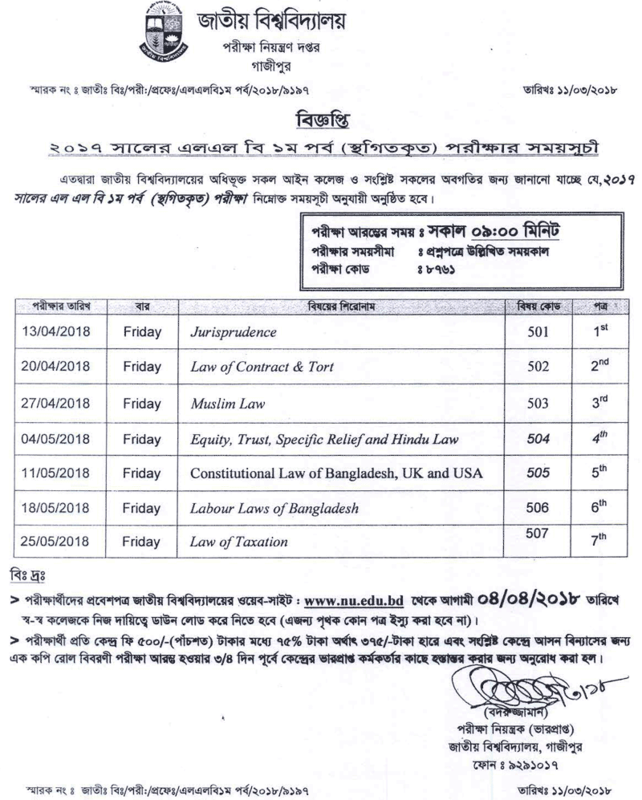 LLB Exam will be start on 13-04-2018 . www.nu.edu.bd official website published LLB 1st Part Exam Schedule on 11 March 2018. Every Student can Download 2018 First Year LLB Exam Routine from our website at bdeducationinfo.com . LLB Examination will be Start on 13 April 2018 and exam will be end on 25 May 2018. LLB Exam will be Start on 09 AM . Exam Code is 8761 . See below this Full information. If You want to Download LLB Routine as a PDF file visit NU Official website. Hope You Successfully Download LLB 1st Year Exam Routine 2018 from this website. For Next Updates about LLB Exam Result Keep visit this website. Thanks for Stay visit this website. This entry was posted in Exam Routine, National University Result, Notice and tagged LLB 1st Part Routine Download by admin. Bookmark the permalink.